Metal safety plug is stripped and stuck in my 100 lb Propane tank. How to remove? I have a 100 lb propane tank in a remote camp that was shipped out with a stripped safety (POL?) plug and the tool I have for removing it won't budge it. Someone has since tried to drill it out, but that has only done more damage. Anyone have suggestions on how to remove a stuck propane plug? Please help! I am running out of propane, and this is our last full tank. Call a professional plumber or your propane distributor to repair the tank. So very sorry to hear of your predicament. Not a good thing to run out of propane when the weather gets cold. Your safest alternative will be to take your propane tank to your local propane service center. Crowley or Amerigas was recommended by Suburban Propane. Time to make some phone calls to find the right repair center before it gets really cold!! I should have thought of this earlier but, you can also use a spray called "Blaster". This is a penetrating oil that will dissolve rust and make it easier to remove your stuck/rusted safety plug. 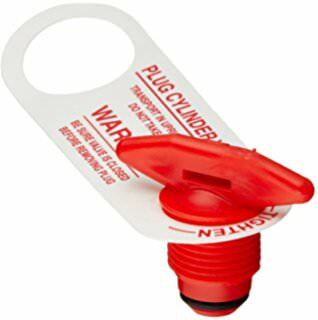 Remember that this plug is "reverse threaded, which means your turn it clockwise loosen it and counter clockwise to tighten it. All of the POL that I have seen have been made of a plastic compound. Worse case scenario, you may have to carefully pull it apart and then order a new one from your local propane supplier.